Album of approximately 101 albumen and 18 Woodburytype prints. 1870s-80s. Varying sizes from 2 3/8 x 3 5/8in. (6 x 9.2cm.) to 8 5/8 x 10 5/8in. (21.9 x 27cm.) or the reverse. 16 numbered, 11 credited and 2 titled in the negative. Printed credit and title label affixed to front free endpaper. Black half leather, gilt. 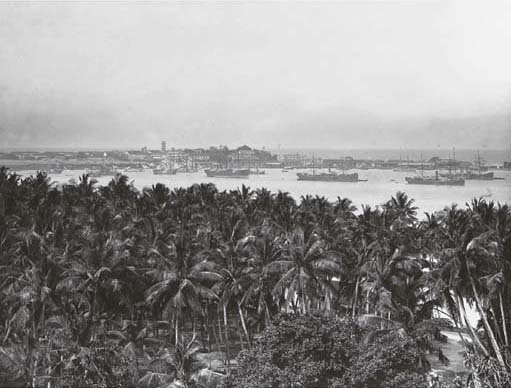 See: British Council, Regeneration: A Reappraisal of Photography in Ceylon 1850-1900, pl. 23, for a variant. Includes villlage and rural scenes, giant bamboos at Peradeniya, Colombo Harbour, Rambodda Falls and scenes in and around Kandy. Portraits include Kandian women, Tamil women and musicians and a Singhalese boy. Also includes 4 circular amateur snapshots of water scenes.